Could There Be A More Decadent Combination? "Everything's better with bacon" is one of those cliche sayings that is absolutely, undeniably true. 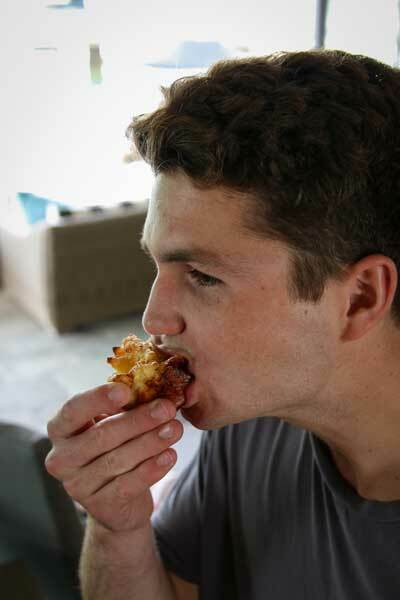 Likewise, do you know anyone who doesn't love Mac and Cheese? It is not hard to imagine these two paired together. I developed these over-the-top appetizers to pay off a Rummikub bet. If you have not played Rummikub -- The Original Rummy Tile Game Rummikub, I highly recommend this game of logic and chance. I've introduced Rummikub to dozens of people of all ages and backgrounds. Whether you are right-brain, left-brain, math oriented, word oriented, an accountant type, a creative soul, Type A or Type B, introvert or extrovert, Rummikub appeals to many people. Invented by Ephraim Hertzano in Palestine in the early 1930's, this game has stood the test of time, crossed international borders and was the best-selling game in the U.S. in the 1977. But I digress...back to the Bacon-Wrapped Mac and Cheese Cups. These Mac and Cheese cups were a big hit with everyone I served them to. Clearly, they are a special treat, right up there with a big ol' ice cream sundae. Most people ate one or two, all the while moaning about how good they were. My amazing son Mikey consumed five of these bad boys, but not without a little regret. Wouldn't it be great to be 23 again so you could eat whatever you want, whenever you want? This recipe makes 30 of these Mac and Cheese Cups, which goes a long ways. I made 12 on Thursday and then baked the rest over 4th of July weekend as guests wandered in and out. I had planned to bake and freeze a few to see how they did, but they were all gobbled up each time I pulled a batch out of the oven. I think the key to successful freezing would be to wrap the cups closely in plastic wrap, minimizing their contact with air. If you freeze them, please let me know how they work out! This recipe uses both cream and creme fraiche, which is very similar to sour cream. The nice thing about creme fraiche is it does not curdle when you cook it. You can make your own creme fraiche for a fraction of the price of store-bought. Check out my post to see how to do it. 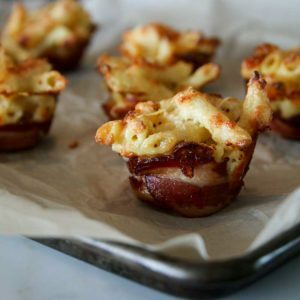 If you like these Bacon-Wrapped Mac and Cheese Cups, you may also enjoy my Bacon-Wrapped Quiche Minis, Bacon-Wrapped Fillet Mignon and my Bacon-Wrapped Turkey. Just don't enjoy these rich treats everyday! Heat the oven to 400 degrees. Lay the bacon slices out on a couple sheet pans. Bake until half done, about 7 - 10 minutes, depending on the thickness of the bacon. 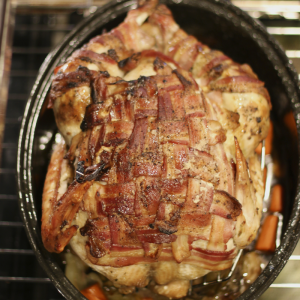 Remove bacon from the oven and reduce the oven heat to 350 degrees. Drain the bacon on paper towels and set aside. While the bacon is cooking fill a large pot with water and a heaping teaspoon of salt. Bring to a boil and cook the pasta al dente to package directions. Drain, but do not rinse. While the pasta is cooking combine, gruyere, creme fraiche, cream, panko, mustard and eggs in a large bowl. Stir to combine. Add drained pasta to the cheese mixture and toss to thoroughly coat the pasta. You may find tossing with your hands does the best job. Bake the Mac and Cheese in muffin cups. Lightly wipe each cup with a piece of bacon to grease the cup so the mac and cheese does not stick. Then ring each muffin cup with one piece of bacon. Fill each muffin-lined cup with the cheese mixture. Sprinkle the top of each cup with a bit of grated parmesan cheese. Bake for 20 - 25 minutes, checking after 20 minutes. Mac and cheese cups should be golden brown on top. Let set 5 minutes and remove. Serve warm. May be prepared in advance either by baking the Mac and Cheese Cups and reheating when ready to serve or by cooking the bacon and preparing the Mac and Cheese filling in advance and then baking the cups right before serving. Well these are utter perfection. Bacon, mac, cheese, bliss. I cannot WAIT to give these a try! Why, in gods name , do people declare a recipe ‘utter perfection’ before even making it??? I get it, it looks good, it sounds delicious, but until you actually prepare the item, don’t say it’s awesome. If your gonna try and convince me every recipe that sounds great, and you eventually make , is 5 stars- I say horse poop! We know that’s a giant crock. If every recipe that sounded good in print came out of the oven as delicious as proclaimed, I’d be a friggin professional chef. How about filing it for the future, make it, and THEN comment. Drive’s me CRAZY! Hi Cooknotchef, First of all, let me say I like your name “Cooknotchef.” It is exactly the way I think about myself, as a cook, not a chef. Second, I understand your frustration in reading reviews that are written by writers who have not actually made the dish. In a perfect world, all reviews would be written by people who actually tried the recipe. As a recipe developer, that would be my first choice, as these hands-on reviews provide the most constructive and valid feedback. Still, I do appreciate all feedback. 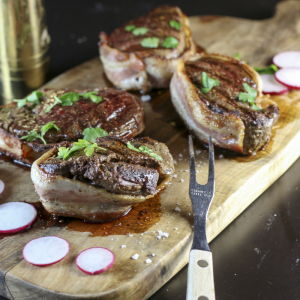 If a recipe sounds good enough to motivate someone to comment on it, I am all for it. In this case I think it is the pairing of bacon and mac & cheese that motivated the writer to review the recipe. For some people this pairing is a match made in heaven. I will tell you that I served this dish to a dozen people, and judging by the number that went back for seconds and thirds, and the oohs, ahhs and drooling that transpired as theses mac & cheese cups were consumed, the dish gets great reviews. That said, I’d love to hear your opinion of the recipe. Thank you for writing in! where you list (2 cups of cream) for part of the ingredients, what type of cream are you referring to? Love the little American flag garnish! Thank you for sharing. Next time you come home I will make you these! These were great fun to take to our neighborhood potluck last night. I was hopeful I might bring a few home…not a chance! I must admit, knowing I was going to be pressed for time, I bought a Costco casserole of pre-made mac and cheese and used that for the filling. I know your recipe would have been even tastier, but sometimes you just have to do what you have to do!! Can’t wait to make these again the REAL way! Thanks for sharing Kim.